Two motorists who repeatedly undertook and tailgated each other on the M4 near Port Talbot have been convicted of dangerous driving. 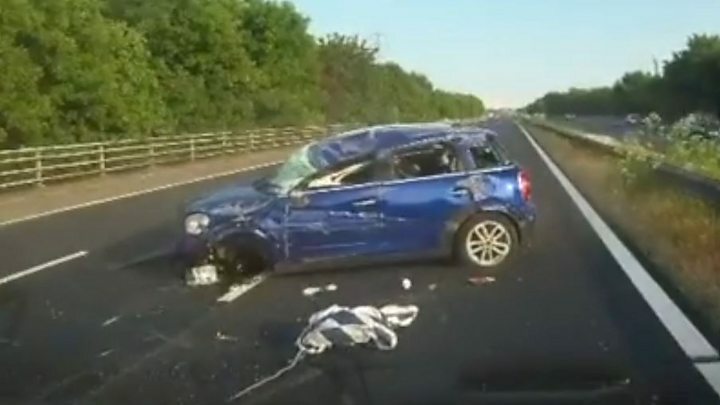 Dashcam footage showed Paul Carpenter, 44, from Boxhill in Surrey, and Wayne Sebury, 59, from Pontypridd, reaching speeds of up to 101mph on the eastbound carriageway in June last year. The road rage-prompted race led to Sebury's Mini flipping onto its roof. The pair admitted dangerous driving at Cardiff Crown Court on Thursday. Carpenter was sentenced to six months in prison, suspended for 24 months, and was disqualified from driving for 18 months. He was also ordered to complete 200 hours of unpaid work and pay a £125 victim surcharge. Sebury was given an 18-month community order and was disqualified from driving for 12 months. He must also carry out 150 hours of unpaid work and pay a £85 victim surcharge. PC Kathryn Matthews, of the South Wales Police Roads Policing Unit, said: "This incident was a classic case of road rage where two motorists have driven dangerously, at high speeds, undertaking, tailgating and flashing their lights. "It is sheer luck that nobody was killed or seriously injured and the dashcam footage of the incident sends out a clear message about the consequences of driving in such an irresponsible manner."